RETRO KIMMER'S BLOG: RESTORED BARTON ORGAN UNVEILED OCT 29!! Ann Arbor, Mich. – When the 86-year-old Barton Organ was pulled from the Michigan Theater historic auditorium in late June, it was anything but a sad good-bye. Teams from Ann Arbor-based Renaissance Pipe Organ and Littlefield & Sons Furniture Service began the slow, painstaking process of restoring the Barton to her original 1928 state. After three months of hard work, including rebuilding electrical components and mechanical parts, installing a new solid-state relay system, and cleaning and retouching the console, the restoration is almost complete. The mighty Barton will return for a special screening of Nosferatu, the original vampire film, on Wednesday, October 29, at 7:30 PM. 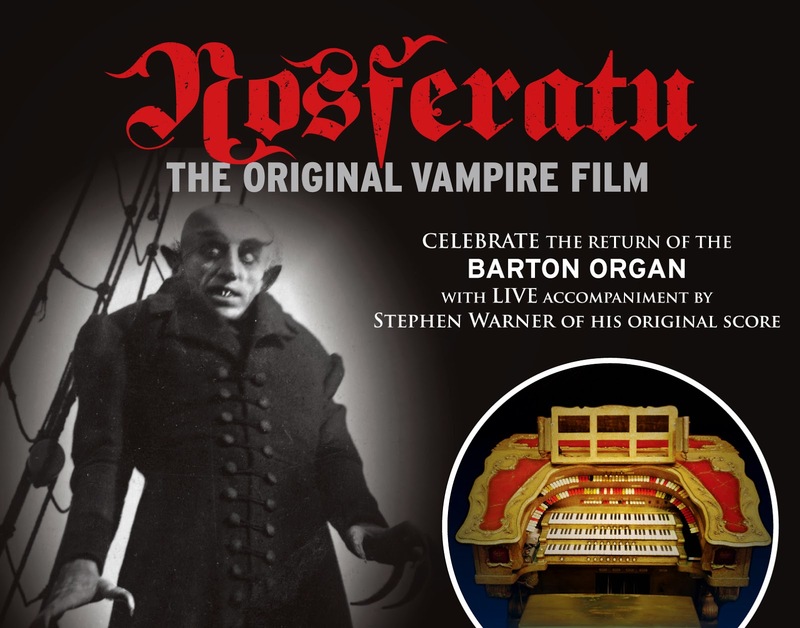 As in previous years, organist Stephen Warner will accompany the film with a performance of his original score, which enhances the spookiness of the 1922 classic. To celebrate the Barton's return, a special pre-show reception featuring drinks and hors d'oeuvres is open to VIP ticketholders from 6:00-7:00 PM. Advance tickets are available at ticketweb.com. Tickets are $15 (general), $12 (students, seniors, veterans, kids 12 and under), and $10 (Michigan Theater members). VIP tickets are $50 for the general public and $25 for Towsley Society, Gold Card, and A2Y Chamber members. In addition to the reception, VIP tickets also include reserved seating for the film.